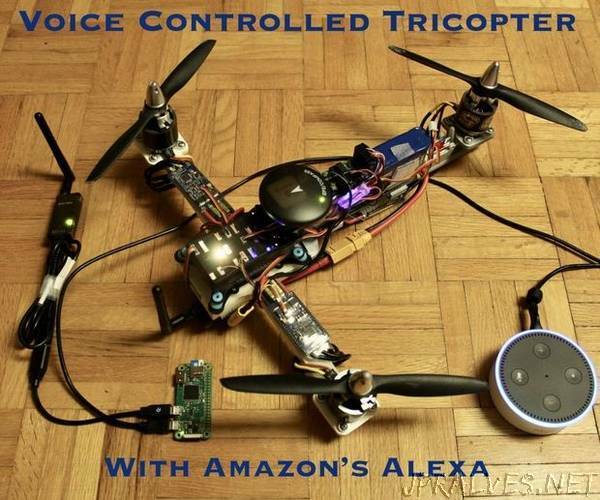 “This is a fully 3D printed Tricopter drone that can be flown and controlled with voice control using Amazon’s Alexa through a ground station controlled by the Raspberry Pi. This Voice Controlled Tricopter is also known as Oliver the Tri. A Tricopter unlike the more commonly drone configuration of a Quadcopter only has 3 propellers. To make up for one less degree of control, one of the rotors is tilted by a servo motor. Oliver the Tri features a Pixhawk Autopilot, an advanced autopilot systems largely used in the research or advanced drone industry. This autopilot system is capable of wide variety of flight modes including follow-me, waypoint navigation, and guided flight. Amazon’s Alexa will be using the guided flight mode. It will process the voice commands and send them to the ground station, which maps these commands to MAVLink (Micro Air Vehicle Communication Protocol) and sends them to the Pixhawk via telemetry.